NASA's Spitzer Space Telescope took this image of a baby star sprouting two identical jets (green lines emanating from fuzzy star). 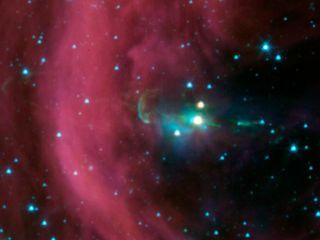 The Spitzer image shows that both of the twin jets are made up of identical knots of gas and dust, ejected one after another from the area around the star. By studying the spacing of these knots, astronomers were able to determine that the jet to the right of the star punches its material out 4.5 years later than the counter-jet. Twin jets of gas that shoot out from opposite sides of a young star may appear symmetrical, but they actually blast out into space in supersonic eruptions that are staggered about 4 1/2 years apart, scientists say. "More studies are needed to determine if other jets have time delays," said Alberto Noriega-Crespo of NASA's Spitzer Science Center at the California Institute of Technology in Pasadena, Calif. Noriega-Crespo is co-author of a new study that will be published in the April 1 issue of the Astrophysical Journal Letters. "Now we know that in at least one case, there appears to be a delay, which tells us that some sort of communication may be going on between the jets that takes time to occur," Noriega-Crespo said. The researchers think that some form of communication is occurring between the jets, which may be carried by sound waves through the disk of material surrounding the star. Young stars typically emit high-speed jets of gas during an active phase in their evolution. A star begins its life as a collapsing cloud of gas and dust. By ejecting supersonic jets of gas, the cloud slows its spinning. As matter coalesces onto the growing star, it develops a disk of swirling material around it, with twin jets firing from above and below the disk, like a spinning top. Once the baby star ignites and shines with starlight, the jets tend to die off and the surrounding disk of material will thin out, researchers said. In some cases, planets may form as the material clumps together in the spinning disk. This discovery of the time-delayed jets, which are called Herbig-Haro 34, has also helped astronomers measure the size of the zone from which the jets originate. Observations from the Spitzer Space Telescope show that this zone is limited to a circle around the young star that is about 10 times smaller than previous estimates. "Where we stand today on Earth was perhaps once a very violent place where high-velocity gas and dust were ejected from the disk circling around our very young sun," said Alex Raga of the National Autonomous University of Mexico in Mexico City, who is lead author of the new study. "If so, the formation of planets like Earth depends on how and when this phenomenon ended. Essentially, every star like our own sun has gone through a similar cloud-disk-jets formation process." One of the jets in Herbig-Haro 34 had been studied extensively for years, but its twin remained hidden behind a dark cloud. The sensitive infrared instruments aboard Spitzer were able to peer through the dusty cloud to see the second jet in greater detail than ever before. This image layout shows two views of the same baby star -- at left is a visible-light image, and at right is an infrared image from NASA's Spitzer Space Telescope. Spitzer's view shows that this star has a second, identical jet shooting off in the opposite direction of the first. Both jets are seen in green in the Spitzer image, emanating from the fuzzy white star. Only one jet can be seen in the visible image in red. The Spitzer images also revealed that the previously obscured jet is perfectly symmetrical to the other, with identical knots of ejected material. The symmetry of the two jets helped the astronomers piece together the time delay. By measuring the exact distances from the knots of material to the star, the researchers were able to figure out that, for every cluster of dust and gas that is blasted out by one jet, a similar cluster is shot out in the opposite direction 4.5 years later. Knowing the length of the time delay and the speed of sound allowed them to calculate the maximum size of the star's jet-making zone. The astronomers are currently analyzing other jets observed by Spitzer to look for more evidence of time delays. The Spitzer data used in the study were collected before the telescope used up its liquid coolant in May 2009.